By potentially affecting the disease biology of chronic myeloid leukemia, smoking may increase the risk of death. Previous research has suggested that tobacco smoking is a risk factor for developing CML and an adverse prognostic factor for the disease; however, the studies showing an unfavorable prognostic effect were conducted in the era prior to tyrosine kinase inhibitors (TKIs) or within the context of hematopoietic cell transplantation (HCT). To investigate the affect of smoking on progression to advanced disease and survival in patients with CML in the era of TKIs, researchers analyzed data from 1326 participants of the German CML Study IV (ClinicalTrials.gov Identifier: NCT00055874), which evaluated imatinib with or without interferon alfa or cytarabine compared with interferon alfa followed by HCT in newly diagnosed patients with CML in chronic phase. Of those, 20% were smokers at the time of diagnosis. Results showed that the 8-year overall survival probability for nonsmoking patients with CML was 87% (95% CI, 84-89) compared with 83% for smoking patients (95% CI, 78-88). After adjusting for multiple variables, the researchers found that current smokers were twice as likely to die as nonsmokers (hazard ratio [HR], 2.08; 95% CI, 1.4-3.1; P < .001). Investigators observed an interaction between smoking and age, with only smokers aged younger than 60 years having a significantly higher risk of death compared with nonsmokers in the same age group. Smoking did not appear to affect the risk of death in older patients with CML. 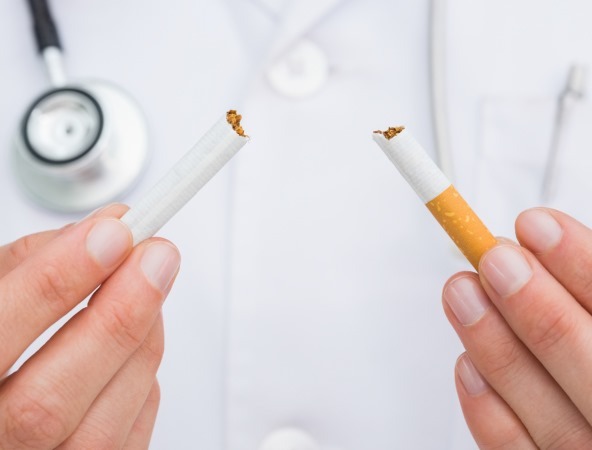 The 8-year cumulative incidence of disease progression to advanced phase for a nonsmoking patient was 7% (95% CI, 5-8) vs 12% (95% CI, 8-16) for a smoker. Patients who smoked were also 2 times more likely to experience disease progression than nonsmokers (HR, 2.11; 95% CI, 1.3-3.3; P = .001). However, there was no significant difference in the molecular response rate or rate of adverse events between the 2 groups. The findings ultimately suggest that clinicians should encourage and support patients with CML, particularly those aged younger than 60 years, to quit smoking.